Why it makes me happy - that ties the most I have had in a round at my course. There will come a day when it will be more. You know one birdie is always a HappyUP!! !...triple it. Why it makes me happy - I hit about as many pure irons today as I have in a long time. Golf is so funny...and frustrating. When you hit it good, it is so easy...when it goes bad, it is a struggle. Why it makes me happy - I had a terrible start to my round today. Yet, one little sand shot turned the trick on hole 5 and I played well from then on. Why it makes me happy - my friends just crack me up....they really do. Why it makes me happy - we had 8 guys playing skins today and I got one of the 5 skins which returned my entry fee and a little bit more. Why it makes me happy - my friend is thrilled with the new digs....and I got to see it before the furniture arrived. The pad is out at Morgan Creek, my golf course, so there are going to be some parties going on!...and very convenient for me. Why it makes me happy - I was the first guy on the course once I played through one person. There is nothing like being on the course with no one in front of me. I hit a lot of quality shots and had the usual (of late) average round. Considering I started by bogeying 4 out of the first 5 holes, it was a good score to get to. Why it makes me happy - one of the guys is a great player....and the other is a buddy that likes to take my money. They are a lot of fun to play with so we had a good time. Why it makes me happy - it was a pure shot.... at the right time right after I pressed some bets. Why it makes me happy - it was a birdie....on 18 which I don't often birdie....and it came with a lot of bets on the line.....a lot. I pocketed some good cash...HappyUP!!! Why it makes me happy - we had good conversation...and a new venue. The place where we have met, La Bou, for the last umpteen years for this standing meeting has closed...a victim of the Invisible Hand. Why it happened - he needed a game. Why it makes me happy - I'm glad to be good enough to play on the periphery of his league. I got to see a lot of good shots. Plus, when you play with people better than yourself, you have to step up. Why it makes me happy - you know the drill...a birdie is a HappyUP!!!. Two is one of the hardest holes on our course. Most importantly, it won me a skin in the big skins game that we had with another group. Why it makes me happy - it's good to connect through our current technologies. Texting...e-mailing...facebooking.....none of it is a substitute for face-to-face or phone but it's nice to be in touch. Why it makes me happy - I joined some guys on the third hole today. I didn't get time to hit any balls or practice any putts. I still hit 11 greens from the back tees on a long, wet course. I think I can play much better when I start to practice a bit more...it appears that I have moved my game back to the level I hit back in October. I seem to be upping my level of play. Why it makes me happy - the last hole of any 9 usually has some extra pressure and dough riding on it. The 9th on my course has been tough on me as of late. A birdie is always a HappyUP!!! but one on 9 is a bigger one. Why it makes me happy - we heard the first speech from a newer member today...I love icebreakers. I also learned about an "ice that burns" that comes from the ocean...another possible source of greener energy. On top of it, it was great to hang out with the members. Why it makes me happy - today was the first time this season that I can remember it really pouring....I mean where visibility is impacted....pull the car over to the side of the road...kind of rain. It made me smile in wonder. Why it makes me happy - it's a long story....too long for here. I am just glad to get a few of these done today. Why it makes me happy - I decided that, while watching tube, I would start working on my penny jar. It's kind of like ladies who knit. You can watch TV...talk on the phone...etc...and make money at the same time. I think I made about 12 bucks while sitting around for an hour. Why it makes me happy - he was witness to the playoff and he sent a brief nicety....nothing much....just a few good words. Take note...it rarely takes much to give someone a HappyUP!!! Why it makes me happy - it seems like the local world slowed with the storm yesterday. Some of the communication was serious...some silly....OK....mostly silly. That is just how I like it. Why it makes me happy - my golf partner and I are low handicap golfers...we don't get many strokes given to us. Normally, the low handicappers don't do well in a "net" tournament when strokes are given. We ended up in a 4 way tie for first place amongst 24 two man teams and managed to prevail. Two 2-man teams are then sent to the next round in lovely Monterey, CA, where we play Poppy Hills and the Bayonet Course at Ford Ord!.....and the greens fees are covered! HappyUP!!! Why it makes me happy - it was a sudden death affair where one miscue could knock you out. I hadn't experienced the feeling of these kinds of nerves in a long time. I used my routine to quiet the nerves and played very well in the playoff. Why it makes me happy - I used to work with V. V left to work somewhere else and we lost track of each other. V is a cool person to hang out with and we will out at the club. Why it makes me happy - both birdies involved hitting tricky pitches up to the hole...and I nailed them. Why it makes me happy - the ninth hole has been tough on me. Today, I hit the best drive I could. The pin was in an awful location but I striped the 9 iron right there. Unfortunately, the ball spun off to the side and down the slope of the green (I told you it was a tough pin position) but the drive and 9 iron were about the two best shots that were humanely possible on that hole today. Why it makes me happy - TT is an old friend that is a classic example of the beauty of Facebook. I would have lost track of T but not now. We had a fun conversation and will end up breaking some bread. Why it makes me happy - birdies are where it's at on the golf course. This was my partner and my warmup for our tournament tomorrow. We're ready. Why it makes me happy - these are two of my favorite guys....breakfast was great....the conversation was interesting. Figuring out "Stand By Me"
....is not any kind of philosophy - it's a marketing campaign. Why it makes me happy - there are parts of my own town that I don't know. It had grown so much that I wasn't aware of where all the shops and restaurants are. It was good to get some bearings and make a few discoveries. Why it makes me happy - while I don't feel that I am playing to potential, there are many more good/great shots in every round. The gap between my bad shots and good shots is narrowing as well. Hybrid on 2, 6 iron on 3, drive on 4, 3 wood/9iron on 5, 5 iron on 6, 4 iron on 7, 7 iron on 8, 6 iron/putt on 9, 5 iron on 10, 3 wood/hybrid on 12, 5 iron on 13, 9 iron on 15, 8 iron on 16, driver/8 iron on 18......that is a LOT of solid golfing. Why it makes me happy - this is a friend from WAAAAAAY back that I haven't seen in years. This will be some seriously stimulating conversation for sure. Why it makes me happy - c'mon...you see the blog here. You know that I put a smiley face on my golf balls. How could I be anything but happy when I saw this? Why it makes me happy - there are times when I am out Nutstering around when I feel absolutely unstoppable....I radiate...and I know it. I'm not sure why it happens and I would like it to happen more. This is a level beyond HappyUP!! !....I got there today and it may have had something to do with an old meditation CD I had found. It wasn't so much the message of the meditation as it was that I did an intervention in my thinking. I'll play with this. Why it makes me happy - the training was held at a State Farm operations office here in town....a company/place where I have gone and spoke to their employees before. They told me that they still had speakers come in and wanted me to come back. Why it makes me happy - I had gone 3 days without playing...just being out there was a HappyUP!!! Throw on top that I played OK....got a skin in the big game....led off with a birdie....made some pretty incredible shots......HappyUP!!! Why it makes me happy - we e-mail and facebook all the time....and those suffice. Yet, short of hanging around face to face, you can't beat some voice to voice. Why it makes me happy - you really don't like to have to hit a 3 wood into a par 4....but sometimes you do. I hit the ball today and because of the sun and clouds, I never saw it. Neither did my partner. I thought I hit it OK. We walked up to the green and, low and behold, there my ball was about 15 feet from the hole.....not bad from 22o yards! 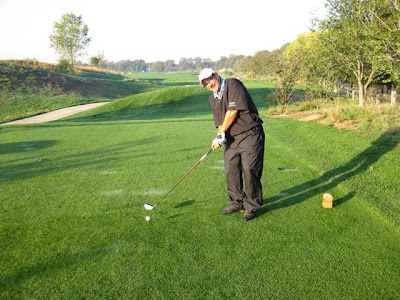 Why it makes me happy - I haven't teed it up in a scratch golf tournament in 20+ years. In April, I'll be trying to qualify for the State Amateur....something I qualified for 26 years ago. WHEN I qualify, I guess I can officially say that I am as good as I was. How often does someone maintain that degree of athleticism later in life? It's going to be great. Why it makes me happy - though I had to turn it down, it is great to be invited. Plus, the invitation came with the person telling me that he is enjoying reading The Four Agreements. Why it makes me happy - the trend broke....and I got hammered on a trade. BUT, I did have some fun trading e-mails with a guy commiserating over it. It was fake commiseration. You can't let the stock market beat you up these days....if you rolls your dice, you takes your chances. Cut the below - and paste it into a Word document. Make 5 copies. Ask yourself each night for the next 5 days how you did. If you want things to change - you have to have an intervention. An intervention is anything that steps in and INTERVENES to change your behavior. Yes....it requires effort - hey, that is a good thing. YOU can do the below....others won't. 15. Realize that life is a school and you are here to learn. Problems are simply part of the curriculum that appear and fade away like algebra class but the lessons you learn will last a lifetime . 23. Don't compare your life to others'. You have no ide a what their journey is all about. 28. Always remember that God can heal everything. 30. Your job won't take care of you when you are sick. Your friends will. Stay in touch. 39. Enjoy the ride. Remember this is not Disney World and you certainly don't want a fast pass. You only have one ride through life so make the most of it and enjoy the ride. 40. Please Forward this to everyone you care about. I just did. Why it makes me happy - we are getting soaked here....and it is beautiful to watch. It's a nice amount without downpours. No flooding locally that I know of. Why it makes me happy - NCIS is a great show...I catch it now and again. With the rain keeping me inside, I didn't feel too bad about catching three episodes. Why it makes me happy - we are playing serious catch up. I am thinking the Sierra's may have gotten a little snow too. Why it makes me happy - it was windy...and rainy....and I woke up....and heard the tumult outside....and both of my cats were still out on my bed. This is NOT the usual program. Babies do cool things...I get the dog owners and the puppy love....but a couple of purring cats is a tough thing to beat for calm. Why it makes me happy - hot coffee...short stack...sausage...sitting by the window looking out at the weather.....niiiiiiccccce. Why it makes me happy - I make notes while reading books on the idea that I get back and do some summarizing. I knocked out a couple of them today. "Thirty three and an income of $50,000 per annum. By this time 2 years from now I can arrange all my business as to make no effort to increase fortune but spend the surplus each year for benevolent purposes. Settle in Oxford and get a thorough education, making the acquaintance of literary men -this will take three year's active work -pay especial attention to speaking in public. Settle then in London and purchase a controlling interest in some newspaper or live review and give the general management of it attention, taking a part in public matters especially those connected with education and improvement of the poorer classes. Man must have an idol - the amassing of wealth is one of the worst species of idolatry. No idol more debasing than the worship of money. Whatever I engage in I must push inordinately, therefore I should be careful to choose that life which will be the most elevating in its character. To continue much longer overwhelmed by business cares and with most of my thoughts wholly upon the way to make more money in the shortest time, must degrade me beyond hope of permanent recovery. I will resign businesses at thirty five, but during the ensuing two years, I wish to spend the afternoons in securing instruction, and in reading systematically." 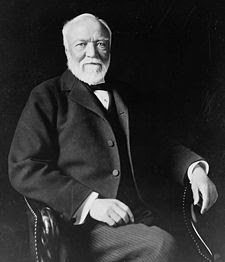 Carnegie didn't get it done - in two years. It actually took three decades for his vision of a life of service to happen. The amazing thing to me - is the amount of clarity Carnegie had at the age of 33. The above is from the book, Halftime, by Bob Buford. Why it makes me happy - I didn't hit it that good but this was the best score of the year. A good short game always comes in handy. Why it makes me happy - they told me some things in the pro shop. I went out to the practice bunker the next two days and worked on it. My technique had definitely been flawed. Today, I was in two traps....and got it up and down both times. I got some training...I worked on it...and it paid off today...HappyUP!!! Why it makes me happy - this guy is a brother from a different mother....no question about it. We did some fun IM-ing. Why it makes me happy - Boz cracks me up. I hadn't golfed with him in a month....and he played good! Why it makes me happy - good up and downs on the first three holes, a nice wedge on 4, a good 4 iron on 7, a nice drive/wedge on 8, a GREAT cut 6 iron on 10, a SUPER par featuring a stellar pitch shot on 14, a nutted 4 iron on 16........it's why I play. Why it makes me happy - waking up to it is always a nice sound.....and we desperately need the rain. Why it makes me happy - all systems AOK.....wheeeeeee! Why it makes me happy - there is something neat about reconnecting with people that, without Facebook, you would never hear from again. Why it makes me happy - it was tough.....lots of wind but that makes it a little more challenging. I hit some really bad shots in the conditions...expected. I didn't expect to hit the pin on 4 for a near eagle! Why it makes me happy - it almost went in. It bounced back a few feet for a tap in birdie. This was a wedge after a great drive in the wind. HappyUP!!! Why it makes me happy - I hit a perfect 4 iron and a perfect 5 iron. You can play some rounds without hitting any perfect mid/long irons. I got two today. Why it makes me happy - it was good chatting with my friend but also with a group of guys that regularly has coffee where we do. Why it makes me happy - it's good catching up with this person. It had been a couple of weeks. Why it makes me happy - Facebook is perfect for staying in touch with acquaintances that should be friends. I found about 3 of them today. Why it makes me happy - I gave a pretty good rendition of "Be Impeccable With Your Word" in a 5 -6 minute span. No question.....I am a work in progress as much as anyone. Today's speech was good for the audience....and for me. Why it makes me happy - I would probably have been playing alone today....I may have filled in with another game....but I like playing with my golf buddy. Why it makes me happy - I qualified for the State Am once. To qualify, you have to meet eligibility which I now do. Why it makes me happy - do you know how amazing it is with what you can do with one of these machines. You can even get images of checks you deposit...right there. Yes, this technology has been around for more than a year but it makes me happy every time I go to the money machine. Why it makes me happy - some people whittle on a piece of wood...or knit...or one of a million things. I could chip golf balls all day long. There is so much creativity involved....and it is going to make me a better golfer. The short game is everything. Why it makes me happy - I used the first of the Four Agreements here as the topic....so I could spend all my time on honing the speech for quality and not thinking so much about structure. The structure was already written out. It just doesn't get - any better than this. Why it makes me happy - many times, I have gotten to the 15th tee and thought, "I could pull this round together with a 2 under finish." I didn't think that today because this round was gone ......and, voila, the 2 under finish happened. I hit some quality shots but the putter came through. Why it makes me happy - it was good to do some catching up over an afternoon refreshment. I also found out some things that I didn't know. Why it makes me happy - it held off and gave us a nice day but it is starting to come down now... and we need it here in Nor Cal. It makes me happy because I am pretty sure that I'll want a drink a bit later in the year. Why it makes me happy - listening to music used to be a big deal to me. I don't keep track of anything current now. With this show, I at least get to hear what is popular. Why it makes me happy - we were on an up tee....so I smacked a three wood off the tee, hit it again off the fairway, and got within range of my 60 degree wedge....which I hit to about 2 1/2 fee. A good start is a superHappyUP!!! Why it makes me happy - I got to meet a couple of guys that I had heard of at the club. I also got pared again with another good guy that I played with last fall. Fellowship. Why it makes me happy - c'mon...you've lent out money. Admit it....it's a good feeling when it comes back. Why it makes me happy - I was kind of a load to my partner today. Knocking in the 25 footer on this tough hole helped the effort. 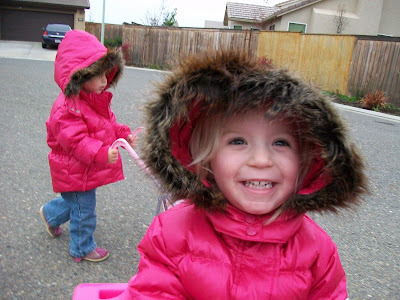 Why it makes me happy - we actually netted out a good week in the financial markets. Can we start seeing some gains here? Why it makes me happy - I always play with R...today, we played with these two other good players.....we even won a couple of bets! Why it makes me happy - I am "second chair" on this mentoring job....which means that I don't do much....perfect for a guy like me! LOL It's actually nice to sit back, make some notes, and just sprinkle a few seasonings upon the group. These are some good people. Why it makes me happy - I never have made a grilled chicken/pastrami/cheese sandwich....and I have never seen it on a menu. I must say...it was tasty! Why it makes me happy - this guy had the perfect tools and we did what we needed to do in a snap! Plus, it was just good to see him. I used to work with him and hadn't seen him in a long time. Why it makes me happy - it was just beautiful to be outside. The golf wasn't much to brag about. I hit a few very good shots. You can't hit it well every day. I still could have rescued the round with a few putts. I think I am on the verge of playing lights out again. Why it makes me happy - it was brief but we had a fun chat. Why it makes me happy - I hit 200 pitch shots on Monday. The shot I had today was a little tricky but it was hit perfectly and fell nicely into the cup. It's cool when you watch a chip roll and you KNOW it's going in. Why it makes me happy - his company got in the news today....and not for a good reason. We had some laughs about it. Why it makes me happy - I don't see this guy enough so it was nice to chat a little bit. Hey....Any Room at the Inn? Awhile back - I made a list of things that would be likely results of the economic squeeze. My number one item - people moving in together. Multi-family households in a single family house would become more of a norm. While kids have always - had the revolving door with parents as the younger set try to get established in this world, this downturn would lead to something more. I even foresaw that you would see non-related families moving in together. Brothers and sisters was on the list. Aging parents was a given. I found the article in USAToday-today to be very interesting. It talks about this very phenomenon. The article described something I hadn't thought about - divorce rates are falling because couples can't sell the home they are in. Even if they could, the cost of setting up separate households would be prohibitive. Even though many of these couples are living a "War of the Roses" existence with boundaries/schedules set up, I see nothing wrong with a little "cooling off" period under one roof. Who knows? Maybe these people can work it out. The comment that really perked my interest was this one - "moving in with relatives can be demoralizing, humbling, dehumanizing -but a lot of people don't have a choice. You lose that sense of independence, privacy, and self-esteem. You lose somewhat of your identity." I get what the guy is saying - but since when did living in more space than you need be a vital fuel to one's self-esteem? As said, I "get it" and I am not arguing that this doesn't happen. The better question - WHY would anyone allow their stuff to define who they are?....even to ourselves? 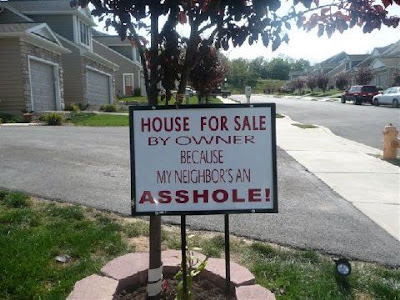 Why it makes me happy - I'll be stopping by to visit J.....and J is going to do me a favor and take care of a little niggling issue that I have been tolerating. J has the tools for the job. Why it makes me happy - love JJ...wish we could have done lunch...but our phone chat was terrific! Open Happiness - is Coke the new Dalai Lama? 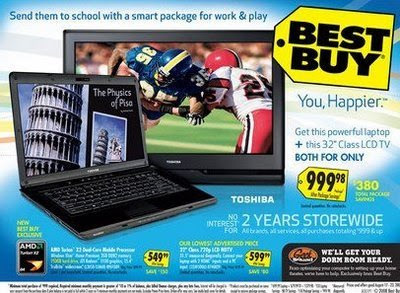 Many of you may have seen the Best Buy campaign - that said, "hey...you! Come in here. Buy an expensive electronics thing that you probably really don't need....you'll be happier!" OK - it didn't really say that. That was my translation. 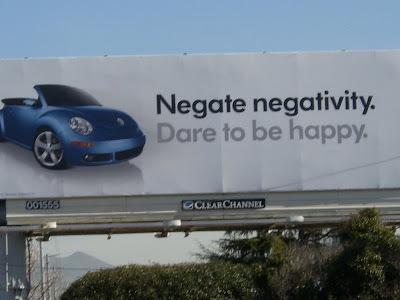 Still, I find it interesting - that so many marketing minds have now shifted over to flat out putting the word and concept of happiness in their promotions. Happiness has always been - the basis of most consumer advertising....but it has been subliminal. Now, Coke has a new drone - "Open Happiness"
Coke must have done some heavy market research - you don't go plunking down millions of dollars for 30-second spots without serious data to back up the decision. ...it's to be happier - and what says happiness like sucking on some carbonated, flavored water....or getting a new big screen.......or buying a Volkswagon? I have another idea - and I'll save you some dough and some calories. 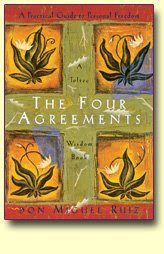 Directly from the author - "With just this one agreement, you can completely transform your life"
Whoa! That's a pretty heavy statement - and the first thing to understand is that you make assumptions about everything...and BELIEVE they are the truth. ...but, what if your assumption is wrong - your life will change dramatically for the worse in an instant. When I hit that "just changed green light" situation, my head is on a swivel. I may or may not avoid someone that ran that red but I am ready to take an action that may save a life...mine or the other driver. OK....a very literal example - let's build from there. Let's say you are in a relationship. The other person knows you well. You assume that your partner knows what you think and want and that you don't have to say it. They know you that well is what you assume. If they don't do what they should, you feel violated or hurt and either think or say, "they should have known." The result - sadness and drama. These assumptions go on all day long - with children, co-workers, bosses, etc. I challenge you - write down "assumptions" somewhere where you will see it all day. Count or make a quick note of all the assumptions you make. Question your assumptions. Happiness and increasing it's level - is HARD WORK. It is why our constitution says, "....the PURSUIT of happiness." While the pursuit can and should be fun and meaningful, the word "pursuit" should connotate that effort is required. How do you stop making assumptions? - you ask questions. If you don't understand why something happened, ask the courageous question to find out. When you fail to do this step, you get mad, mope, and behave poorly. You become a victim. Find your voice - to ask for what you want. Everyone has the right to say "yes" or say "no" and all have the right to ask. When communication is clear - all relationships change. This is what I want...this is what you want. Here is a real insane kicker - you may not know what you want. "I don't know what I want but it sure isn't this," may even go through your mind. Yet, you assume someone else will figure out what you want. This is called a recipe for disaster. Saying you will make no assumptions - sounds easy but we do the opposite based on habits and routines. Awareness and understanding is great but ACTION is what is required. Action is asking questions - make it a goal to ask some questions today of people around you that you wouldn't have asked before. If you are at work as you read this, try it out and think of an assumption about a co-worker that you know and ask a question. Do the same when you get home. Do It Now! - Make note of what you find out in your journal. You should walk away anywhere from amazed to enlightened with your findings. Make this one change - and as Don Miguel Ruiz says, "you will completely transform your life." Why it makes me happy - I had a 10 footer on one, a 10 footer on 4, a 10 footer on 5, an 8 footer on 6, and a 8 footer on 12....it would have been nice to make one of those putts but I have to focus on having the opportunities. On the day, I was 3 for 8 on birdie opportunities. Why it makes me happy - held it at the same as last week....which is four pounds lighter than the beginning of the year. This is without trying too hard. I'll make some modifications this week to try to keep things dipping down. The less I weigh, the better I feel. Why it makes me happy - my new coverage should save me some dough....always a HappyUP!!! There was also some confusion....I was uncovered for the last week or so. I got a new appreciation for people that live without health insurance every day. It's a bit scary. Why it makes me happy - there is nothing better than a thrilling game....for all the stakes...with both teams laying it on the line and playing their hearts out.....only to have one of those hearts ripped out. No StuporBowl this year. Why it makes me happy - we have a 19 year old golf prodigy on the horizon. By winning this prestigious tourney, he steps up in the eyes of the world of golf. People are saying, "this guy is better at 19 than Tiger Woods was." McElroy does not have 3 US Amateur titles on his C.V. but he has a professional win when, at the same age, Tiger was still slapping it around at Stanford and didn't have a pro victory.